Many years ago, when someone was diagnosed with cancer they were told to avoid any and all types of physical activity. People feared that the increase in blood flow would cause cancer cells to spread throughout the body, exacerbating their condition. Of course, any type of movement that causes pain, nausea, shortness of breath, or rapid heart rate, should be avoided. However, too much inactivity can impair range of motion and cause muscle weakness – leading to reductions in body function. Conversely, decades of research demonstrate that under most circumstances, exercise is not only safe during cancer treatment, it is also very effective at reducing side effects! 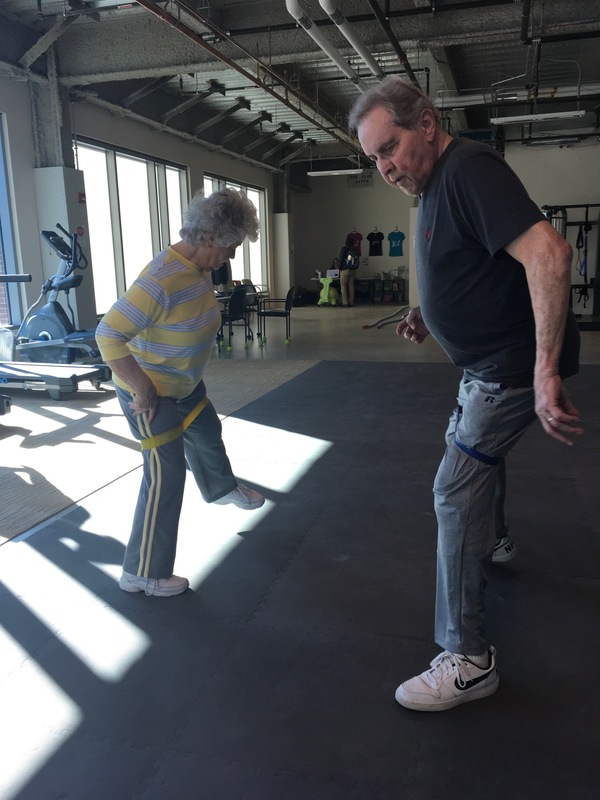 Patients who exercise during treatment can expect to see improvements in their quality of life and functionality. During cancer treatment, medicine is used to weaken or destroy cancer cells in the body. Sometimes, this medicine cannot tell the difference between a healthy cell and a cancer cell. This is often the case with chemotherapy drugs. Chemotherapy is designed to target rapidly dividing cells in a specific stage of cell division. As a result, healthy cells that divide quickly (including cells in hair follicles, nails, mouth, digestive tract, and bone marrow) are harmed. This leads to the side effects we are all familiar with – fatigue, anemia, muscle weakness, cardiac abnormalities, nausea, and the like. What Can Help Reduce Side Effects? Exercise is a safe and effective intervention that can minimize treatment-related side effects. More than 15,000 published, peer reviewed research articles demonstrate that exercise improves cardiovascular endurance, muscular strength, fatigue, anxiety, depression, body composition, mood, sleep, and quality of life. The goal of exercise is to stay as active and fit as possible throughout treatment. If someone engaged in a regular exercise program prior to their diagnosis, they may need to reduce their intensity levels in order to protect their immunity during treatment. However, as much as they are able, their regular exercise routine should be continued. If someone was sedentary before a cancer diagnosis (which is the case for approximately 85% of the patients we serve at Maple Tree! ), they will likely need to begin with low intensity, shorter bouts of exercise. Begin with approximately 10-20 minutes per session, 2-3 times per week. Low intensity exercises, such as balance, flexibility, and light cardio are best. Can I Exercise on Days I Receive Treatment? At present, the effects of exercise on treatment effectiveness and/or tolerability has not been extensively studied. However, the general consensus is that there are no data to suggest that a patient should not exercise on the same day they receive treatment. In fact, research in an animal model indicates that the combination of exercise and chemotherapy is more effective at controlling tumor growth than with chemotherapy alone! One important thing to note is that the chemotherapy drug, Adriamycin, can cause a patient’s heart to beat irregularly for about 24 hours after infusion. Therefore, if Adriamycin is a part of the patient’s treatment regimen, it is recommended that they avoid exercise on the day they receive chemotherapy. In addition, they should do only very low intensity exercise for 24 to 48 hours after chemotherapy. Are There Any Reasons Why I Should Avoid Exercise? If the patient is experiencing extreme fatigue, anemia, or a lack of muscle coordination, they should avoid exercise. If the patient has a compromised immune system and a low white blood cell count, they should avoid public areas such as gyms and yoga studios until their white blood cell count is at a safe level. If the patient is experiencing neuropathy they should be sure to reduce their risk of falling or being injured during physical activity. It may be helpful to have a spotter present during exercise. If the patient is on a chemotherapy or targeted therapy that may cause heart damage, they should make sure to ask their physician about any exercise modifications that might be necessary. It is very important that the patient get physician clearance prior to starting an exercise program to determine any limitations or contraindications to exercise. It may also be helpful to be evaluated by a physical therapist or occupational therapist first, to determine what, if any, functional impairments exist. Finally, it is essential that a patient work with someone who holds a nationally recognized specialty certification in exercise oncology. This will ensure that their trainer has a thorough understanding of the pathophysiology of cancer and can prescribe exercise accordingly to meet the individual need of each patient. At Maple Tree, our trainers each must pass our Exercise Oncology Instructor certification, which is accredited through The National Academy of Sports Medicine. This is why our patients are able to THRIVE during treatment!